One of the things that I love about cooking, and photography for that matter, is that it keeps me humble. According to The Stud Muffin, I need to keep my ego in check, so he’s pleased that I’ve found things that challenge me and keep me humble. The reasons that cooking (and photography) keeps you humble is the moment you think you’ve mastered a technique, ingredient, or a certain dish or recipe, something happens, call it misaligned stars, faulty human, bad ingredients, Murphy’s Law, humidity…whatever, but something happens and for whatever reason epic failure doesn’t even begin to cover how badly the end results were. As a food blogger and someone who develops recipes I find that I either have fantastic days in the kitchen, or days of epic failure. The great thing about food is that you are always a student of it; you simply never stop learning about it. Even the failures teach me something and make my resolve to better myself in the kitchen even stronger. This salmon dish was one of those epic failures in the kitchen. More so because I couldn’t find the right type of salmon and secondly because my high maintenance camera decided that salmon isn’t worthy of being photographed well. I had to make this dish three times before I was able to get halfway decent photos, and a great tasting piece of salmon. Photographing this dish taught me a lot about my (lack of) photography skills. While I’m working hard on improving, I still want to photograph food in a way that doesn’t intimidate people. I don’t buy fancy props, I don’t buy expensive dishes, I don’t own any photography lights, or a photo box. I just shoot in natural light on a ratty old blue card table that sits in the corner of my small purple Horcrux, also known as the kitchen. When I’m scouring the internet for food photography inspiration I have noticed a trend with food blogs. The photography is amazing and the food is too perfect. I want my photos to be amazing as well, don’t get me wrong. I want you to look at a photo and say “Now this is something I want to make!” I also want to take pictures of what the dish actually looks like when it’s finished, and some of the photos I see online have been gussied up, and staged and there is no way the finished dish is going to look like that when I’m done with it, or when you’re done making it. To me, their photos make the food look intimidating, unapproachable and too perfect. I don’t eat perfect looking food. Do you? Yeah, I didn’t think so. This dish taught me that while my skills will improve, I’ll still do my best to keep the food “real looking”… vs. “perfect”. 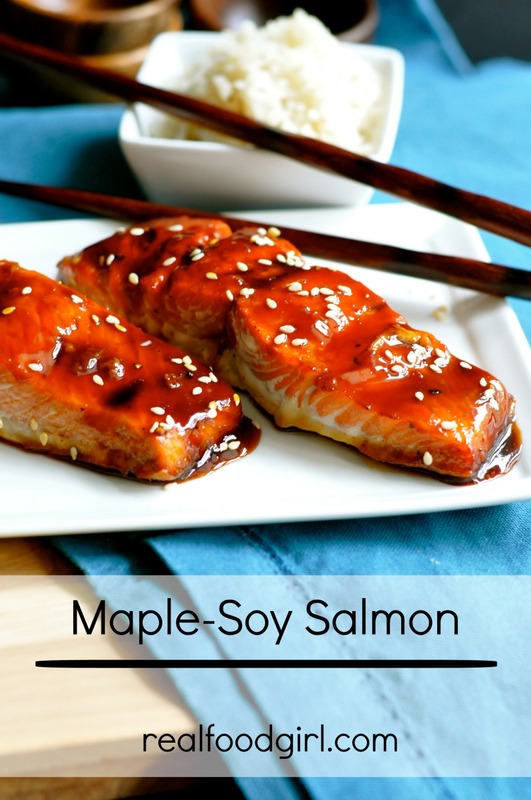 The glaze for this salmon gets super thick as it sits, so if you find that it’s become too thick to brush onto your fish, simply spoon it into a glass jar and put the glass jar in a bowl filled with a few inches of hot water for a couple minutes, or, toss it in the microwave for about 10 seconds. I made a very simple rice pilaf to go along with this dish. I’ll be featuring this simple rice pilaf recipe on the blog later this week. We also had some roasted sugar snap peas along with our rice and the salmon. The peas can roast while you’re prepping the salmon (they take about 20 minutes to roast) and the rice takes about 20 minutes in the oven as well, so you can realistically get the rice, peas and salmon on your table in 30 minutes. How cool is that? What is your favorite fish? How do you like to prepare your fish? Do you steam it, grill it, roast it, poach it or fry it? How often does your family eat fish? 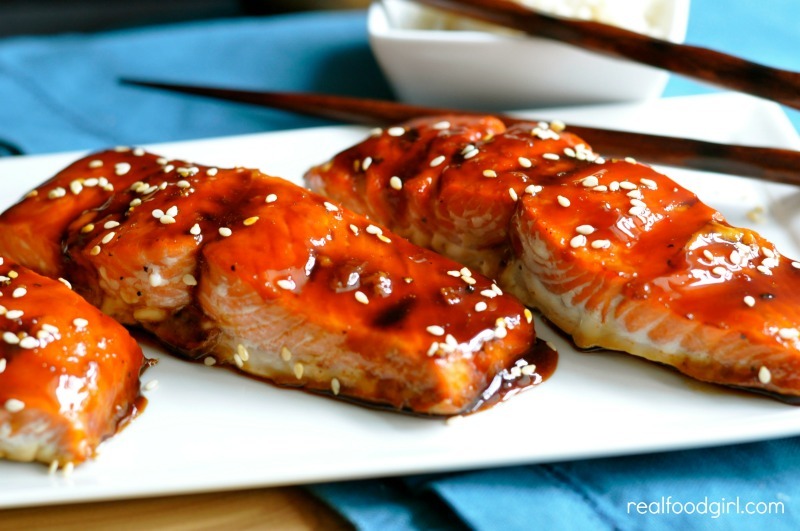 A salty-sweet glazed salmon that is ready to eat in 30 minutes. Line glass baking dish with a piece of parchment paper. The glaze is sticky and you don't want to have issues getting your fish to release from the dish. In a small saucepan, add the syrup and the soy sauce (or aminos) and simmer over medium heat until the mixture is thickened, and reduced down to 1/2 a cup. About 4-6 minutes. Meanwhile, pat salmon dry with paper towels. Remove any pin bones with a tweezers (our fish came deboned) and wipe off any stray scales from the skin side. Lay the salmon skin side down in the prepared baking dish, spaced evenly. 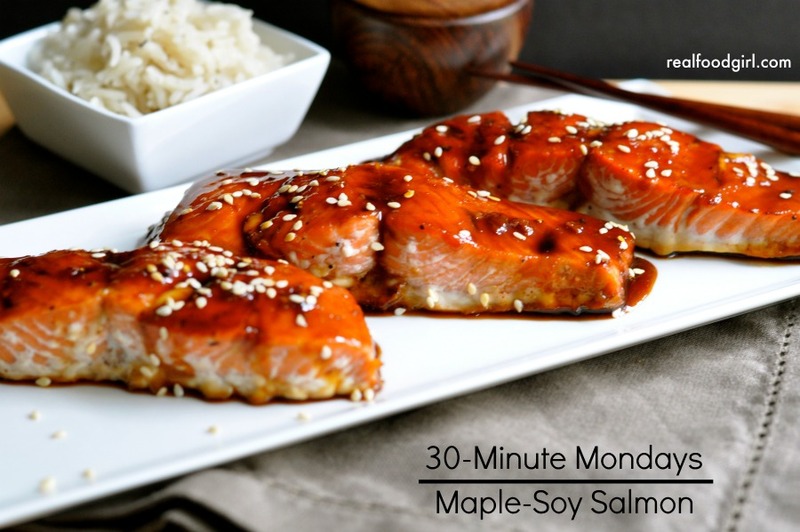 Reserve a third of the glaze in a bowl for serving, then brush the rest of the glaze evenly over the salmon fillets. Bake the salmon for 4-7 minutes until flesh is opaque and separates easily with a fork. OR when a digital thermometer inserted into the thickest part of the fish reads 140-145 degrees. Be careful not to over cook this fish. Salmon tastes fishy if it is over cooked. BRUSH the salmon with more glaze halfway through cooking. 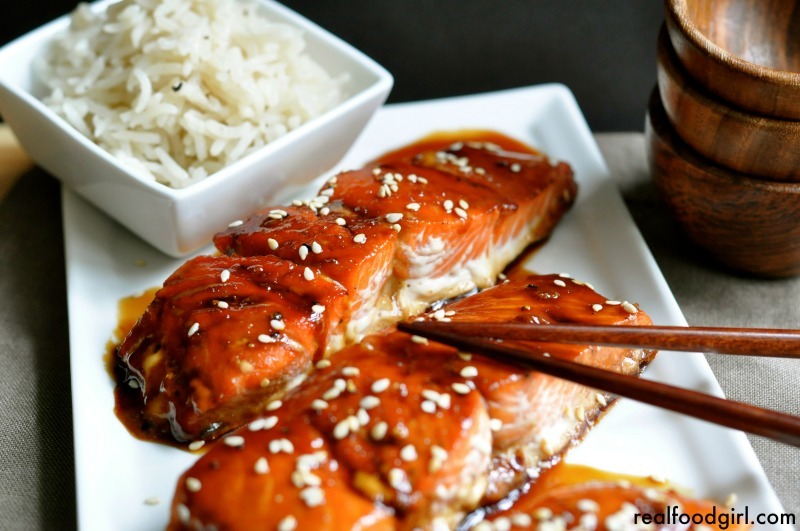 When salmon is finished, drizzle the reserved glaze over each fillet and sprinkle with the sesame seeds. Serve immediately. To toast sesame seeds: Place seeds in a small sauté pan over medium heat. Keep an eye on the seeds and stir or swirl them in the pan frequently until they start to take on a little color. Remove from the heat and set aside until ready to use. I’m always in need of a great recipe for salmon. This looks so easy and packed full of flavor. Can’t wait to make this. Thank you! Thank you, Kristin! 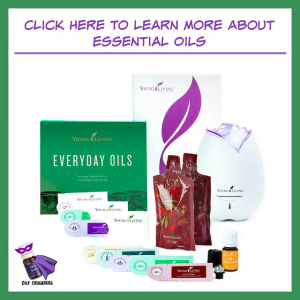 🙂 I think you’ll really like this!